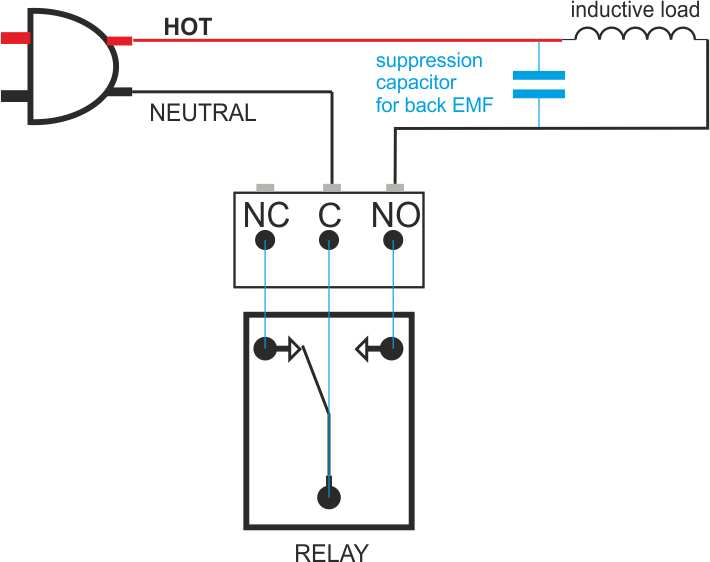 General-purpose relays are typically designed to drive resistive loads, not inductive loads. This is why electromechanical life ratings are published for ohmic loads and not inductive loads. Inductive loads can best be defined as anything with a magnetic coil, such as a motor, solenoid, or a transformer. The purpose of this capacitor is to absorb the high voltages generated by inductive loads. Unlike resistive loads, inductive loads love power, and they will do everything they can to hold on to it. the inductive kickback is far worse with dc loads due to the constant current characteristic of dc power. amp will create a negative inductive kickback of more than 300 V.
to unplug and plug it again. possible to the Relay Board. DME Polyester Film Capacitors are suitable for this job with capacitance around 0.47uF – 0,68uF will be satisfied. Choose larger voltage rating than your power supply. If you can't find it you can use other Metalized Polyester Film Capacitor.